“Since ELEKTRA and DER ROSENKAVALIER, with the only exception of INTERMEZZO, all previous operas by Strauss were based on libretti by Hugo von Hofmannsthal who died in 1929. Stefan Zweig, who was then a celebrated author, had never met Strauss who was his senior of 17 years. In his autobiography THE WORLD OF YESTERDAY, Zweig describes how Strauss got in touch with him after Hofmannsthal's death to ask him to write a libretto for a new opera. Zweig chose a theme from Ben Jonson. A work of great charm when well cast and performed, SCHWEIGSAME FRAU has nevertheless proved one of Strauss' less successful operas. 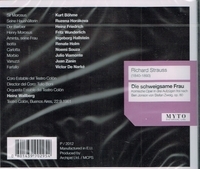 Strauss' association with a Jewish librettist in 1935 Germany provoked a hostile response from Hitler and Goebbels, and even after the war, it has enjoyed relatively few revivals. The work had its United States premiere at the New York City Opera on 7 October 1958.